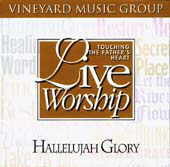 Hallelujah Glory: Vineyard Music EXTRA! From there things slow a bit with Take My Life, a nice (and very popular song in the States) transition song, easy to sing. Lord I Love You, and Greater Grace are intimate worship, and I cry openly when singing these ... Gods love amazes me! Then Secret Place, the start of Set Two, plays deep, and I mean deep, into worship. Some consider this song too personal for corporate worship, but I dont. Let the River Flow must be what Job sung as he was lifted from the depths of misery to the joy of restoration, and Find Rest is a simple, enduring song about just resting in His righteousness. Unfailing Love is up-tempo, and a nice break in the flow (my daughter was born with this song playing, so its very special to me). Restore Me is for the truly repentant only ... Half-hearts need not listen. Finally, Healing Word is an exciting song, building slowly until the chorus, and never looking back!